"STAR WARS," produced by Gary Kurtz, stars Alec Guinness, Mark Hamill, Harrison Ford, Carrie Fisher and Peter Cushing. It was released by 20th Century-Fox. It's a high-energy action movie uniting the hardware of contemporary space adventure with the romantic fantasies of sword and sorcery, plus a dash of wish fulfillment. Lucas' goal has been to make an imaginative entertainment experience that would transport audiences out of the theatre and into an unknown galaxy thousands of light years from earth. "STAR WARS" is a tale of heroes and villains and a romance between a young naive boy and a beautiful, spirited princess. 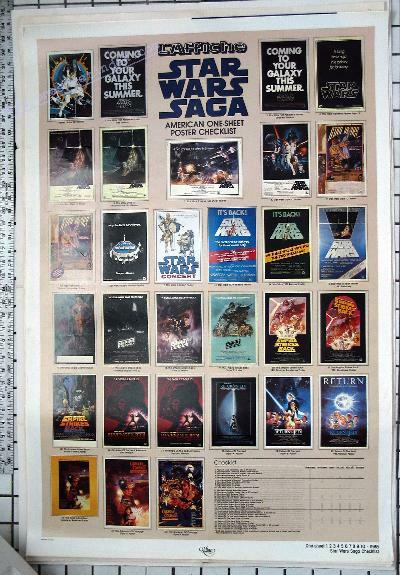 OneSheetIndex.com now has the entire core set of Star Wars posters.